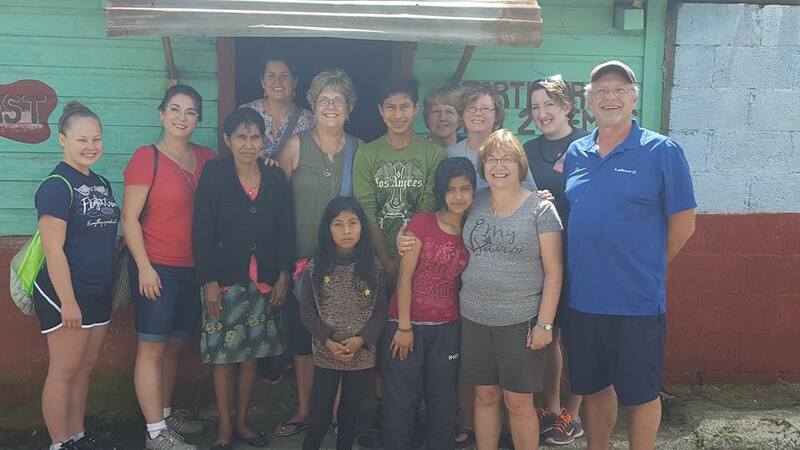 I have just returned from my third visit to Love Guatemala in the village of Magdalena. I had the privilege of serving with 8 members of the Virginia Bridge Guatemala Team and the staff and missionaries of Love Guatemala. As was true of my previous visits, I came back to the states overwhelmed with what God is doing through this incredible ministry. My heart is full to overflowing with love for the people there. Because I had been to Love Guatemala two times already I thought that I knew what to expect and how my visit would impact me. Of course, I was wrong. Each time I go, I am blessed even more than the time before. As I write I am welled up with emotion as I reflect on my most recent experience. I will begin by sharing some of the things our team participated in. Our team disassembled a house made of corn stalks for a family who participates in the feeding center. We also poured a concrete floor, built a bunk bed (sawing the wood, sanding and staining), created slats with scripture verses for the children to gaze upon and installed the bed in the home. We had the opportunity to dedicate the new home for the family. We delivered food to some of the neediest families. We made tortillas in preparation for the arrival of the feeding center children. We served the meal to the children and played games with them, sharing lots of love and laughter in hopes of brightening the dark spots of their lives. Some of our group built, stretched fabric for and painted art canvases to be used by the students in the Art School. While this may seem trivial it is a huge help to the staff and students, freeing them up to use their time to hone their skills. Two of our team members are nurses and taught the mothers of the children from the feeding center valuable first aid skills which will assist them in caring for their families. One of our team members taught nearly 50 women of the village to do manicures and pedicures, a skill which will be beneficial to them as a vocation and help support their families. 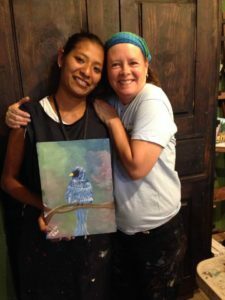 In the Art School, one of our team members worked with students to create beautiful butterfly hugs to be brought back with us and sent to a radio ministry in Virginia where they will be forwarded to cancer patients as encouragement through their struggles. The students delighted in being able to give back and learned that Americans deal with unfortunate things in their lives just as they do. The students prayed for the people in the US who will be receiving these butterflies. Team members also taught in the English and Cooking schools and instructed the Cooking and Carpentry students on fire safety. We were able to pray over the well that is being dug to provide water for the current facility and which will allow for the next phase of the project. PLEASE CONTINUE TO PRAY FOR WATER! This is a huge need. We helped make decorations for the Cultural Night in celebration of Guatemalan Independence day and helped the candidates for queen prepare for their special night. We were made to feel like we were part of their family and experienced their culture firsthand. Pastor Ben was able to share the Gospel with all of the families in attendance and assure them that liberty in Christ is the truest form of freedom. Members of our team were also able to purchase a new school uniform for a little boy who could not participate in his kindergarten graduation without it, as well as clothes and shoes that were much needed by some other children. While we worked hard to complete the tasks above and though these services were much needed and appreciated, these things were not the focus of our trip. We ventured to Love Guatemala to build upon existing relationships and create new ones. We made many home visits to the families of students who attend the school. I was thrilled to have some time to spend with Cruz, the first woman I met on my first trip to Guatemala. On my first visit I learned that her husband was murdered a few months prior and she was struggling to care for her children in spite of her own poor health. I have been regularly praying for her and was excited to see her much healthier and stronger than she had been on my previous two visits. And then there is Julio, who was such a sad little boy when I first met him in 2014. I also have been praying for him and he is a much more confident and happy child because of the opportunity he has received though Love Guatemala, not only due to the skills he is learning and the friends he has made, but mostly because of the love of Christ which is being imparted to him on a daily basis. These are only a small sampling of the lives that have been touched and changed. There is but one explanation for the joy and hope that is evident in all of the people we came in contact with. The Holy Spirit is alive and well and working in the hearts of the people being ministered to because of Love Guatemala. The hugs, smiles and greetings I received far outweighed anything I could possibly share with them. The prayers these wonderful people offered on my behalf were a blessing that I cannot adequately describe. To see how little they have and the appreciation they have for the simplest things causes me to strive for that same level of thankfulness in my own life. One of the greatest highlights of my visit was the privilege of meeting Cesar, a 41-year-old man who is bedridden because of a horrible bone disease that causes excruciating pain, for which there is no remedy. He related his story to us, proclaiming his joy through his suffering because it has allowed him to share the Gospel with others. He gives praise to God and trusts completely in his salvation. He is a great inspiration to me and I will never forget the love he showered on us by welcoming us into his home. He ended our visit by singing “How Great Thou Art” and telling us how he looks forward to running with us on the golden streets of Heaven. He is a true servant of The King. My husband and I will also never forget the smiles of the little boys whose home we were able to build. We will forever carry the memory of the sheer joy on their faces when my husband lifted them onto their new bunk bed. How fortunate we are to have been blessed to witness such a beautiful sight! I could go on for hours telling numerous stories about the people I have come to love with all of my heart. Instead I will close with this thought. I am an incredibly blessed woman who has been given much. Going to Love Guatemala has strengthened me in my Christian walk, in my faith, in my thankfulness and my compassion. Because I have been given much, much is required. My prayer is that I will continue to treasure all these things in my heart and live the life of the servant God has called me to live, wherever I happen to be. Thanks be to God for Love Guatemala and the precious servants that give hope to so many.